Victoria Taylor uses seven different chiles and peppers to blend her Texas Red Seasoning for a pungent and spicy aroma like none other. The depth of flavor comes from cumin, garlic, onion and herbs. 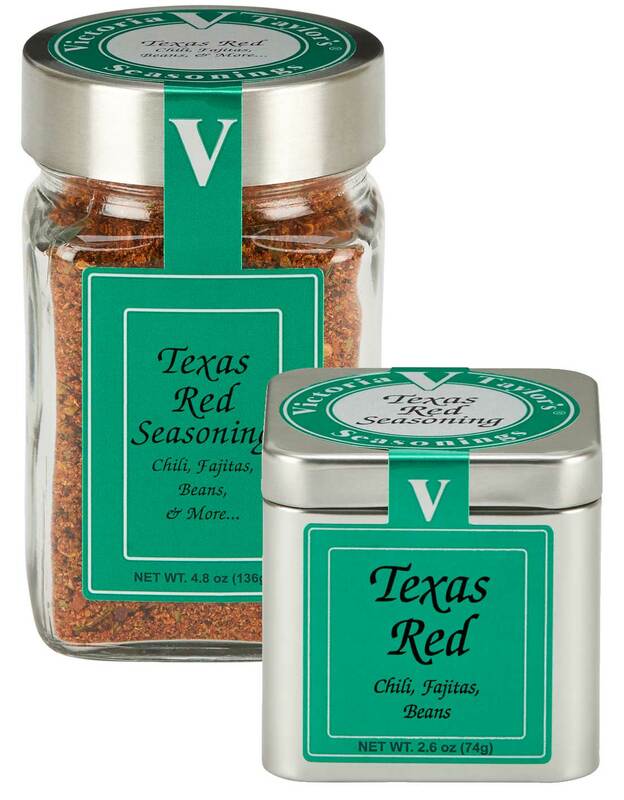 Victoria uses this spicy blend in her Sunday Supper Chili and Texas Red Chili to give them their signature kick. Her recipe for Southwestern Fajitas is a family favorite and really brings out the rich chile character of this blend. Hi! I discovered your seasonings at the [local market] in Manhattan some time ago. Now that I no longer live in Manhattan, I've tracked down the seasonings online so I can get my fix! Your Texas Red seasoning is the *best* chili seasoning I've ever used. I'm going to stock up soon! My mother and I just got back from shopping and I decided to cook some of the beautiful wild Sockeye salmon that I bought. I used your Texas seasonings. One fork full of that salmon and my taste buds exploded.